Shoplifting by supposed ‘customers’ and even by a store’s own staff can cost companies thousands of pounds each year which is why it’s important to have proper security and policies in place to minimise it as much as possible. A company is never going to eliminate shoplifting entirely but there are certain things it can do to reduce the incidences. Two of the main problems when it comes to shoplifting are where the perpetrators think that the security is lax and that they’ve got a good chance of getting away with it and if caught, they might think that they’ll be let off with a stern rebuke. Therefore, any retail company needs to think about its security first by using visual deterrents as their first step in combating shoplifting. A retail store should make their policies on shoplifting visibly clear by putting up notices around the store which state that the store takes shoplifting seriously and that the police will be involved in any incident of shoplifting and that any perpetrators will be prosecuted if caught. That way, many shoplifters, although not all, will be deterred by knowing that they’re unlikely to simply escape with a ‘rap on the knuckles’. Knowing that shoplifting, if proven, will result in a prosecution is also likely to deter more teenage shoplifters. Depending upon your resources, you should try to do all you can financially to put proper security procedures and equipment in place. This can include employing store detectives, CCTV cameras, alarm systems at the doors of the store and, where possible, you should put security tags on merchandise which can only be removed by the shop assistant at the counter. Clothes retailers should pay particular notice to this as shoplifters will often try to operate by taking several items into a changing cubicle and try to smuggle one or more items into a bag whilst, perhaps, only paying for one item. Therefore, you should also ensure a member of staff monitors the changing cubicles and checks the number of items which are being taken in by each customer. Retailers should try wherever possible to set up their store so that their more expensive items are situated in the most visible areas of the store and away front the doors, to reduce the opportunity of an ‘in and out’ grab raid. If you place expensive items near the door, you’re only enticing would be shoplifters to grab an item and make off into the street where they will be more difficult to detect. Even if you employ store detectives, you should also implement staff security training so that your workforce is able to recognise the common behavioural patterns of shoplifters so that they can remain alert to any possible crime that’s about to take place. This will help improve store security. 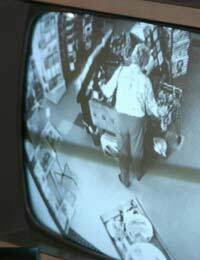 Offering bonuses or incentives to staff that successfully catch a shoplifter will help them to remain vigilant. Training your staff to get into the habit of greeting customers and offering to help them is also good practice as it indicates to a would-be shoplifter that they have been recognised. You should also ensure that no areas of the store are obscured from view and place mirrors in any areas which may be more difficult to see. Although shoplifting would also fall under this term, for the purposes of this article, it refers to staff who might also be involved in shoplifting. To reduce the opportunity for this kind of crime, it’s important you try to screen any potential new members of staff before they even start work. You can do this by thoroughly checking references from previous companies where they have worked. Staff too should be informed about the store’s security policies and told that legal action will result if they are caught shoplifting as well as being told that it would result in instant dismissal. Once again, incentives should be given so that other honest staff can seek to benefit if they catch one of their colleagues thieving. The bottom line is that you’re not going to deter all shoplifters all of the time but by taking the action above, you’re far more likely to see a reduction in the amount of shoplifting crime you have to deal with which can eat into a company’s profits. Also remember, however, that no shoplifting crime is worth putting your own safety at risk so if you confront a suspected shoplifter who is carrying a weapon, do not try to tackle them but let them take whatever they want and then call the police as soon as they have left the store. And, if you have CCTV cameras installed, you're far more likely to bring the perpetrators to justice later. Good article, I wanted to ask though, how do one deal with a shoplifter? considering that the aspect of mistaken identity still holds.